When it comes to lemon deserts I simple can’t resist. I love sour sweet candies, pickles(yes I know not exactly a dessert but can’t help not mentioning them as I just canned 32quarts) and of course lemon curd. Lemon curd, for me, is the queen of lemon desserts, followed another favorite – lemon souffle. Originally I was planning on making pink lemonade cake roll but I ran into some issues so for now I scratched it from the list. I may revisit the idea again in the future though. Not giving up on the general idea meant to look elsewhere. Today we are making Pink Lemonade Cheesecakes. In a bowl beat butter and sugar, gradually add eggs and egg yolks, gradually beat in lemon juice. Pour mixture into a pot and heat over medium low heat. As butter melts mixture becomes smooth. Attach a candy thermometer.Stirring, wait the temperature to reach 170F or until lemon curd thickly coats the wooden spoon or spatula. Don’t let it boil. Remove from the heat and strain. Cover closely with plastic wrap and chill until cool. Speed up chilling process : pour icy water into a large bowl, then slowly lower the bowl with covered lemon curd into the cold water, make sure water doesn’t flow over into the lemon curd. Check the water frequently, keep it chilled by removing some water and adding ice chips or chilled water. You will need small parchment rounds, use metal disk from the mini cheesecake pan to cut out rounds. until incorporated, add vanilla extract and on low speed add flour. Divide batter into 3 portions. Color 2 portions with lemon, keeping one lighter than the other. Pipe lemon slice pattern on the parchment rounds as shown in the video.Freeze for 10-15 minutes. Beat cream cheese, add sugar. Gradually add eggs, yogurt, corn starch, vanilla and strawberry flavor. Lastly add strawberry puree. Spray the pan with non stick spray. Layer lemon slice pattern attached to the disks into the mini cheesecake pan cavities. Fill each cavity with 2 tbl of strawberry filling. Then add about a 1tsp of lemon curd, using a toothpick, swirl it around. Top it with additional strawberry filling. Place an halved oreo cookie on the top. Bake at 325F for 20-22 minutes. Remove from the oven. Cool and then refrigerate for 4 hours or overnight. Gently push each cheesecake out, this is done by pressing onto the removable disk that is located at the very bottom of the pan. 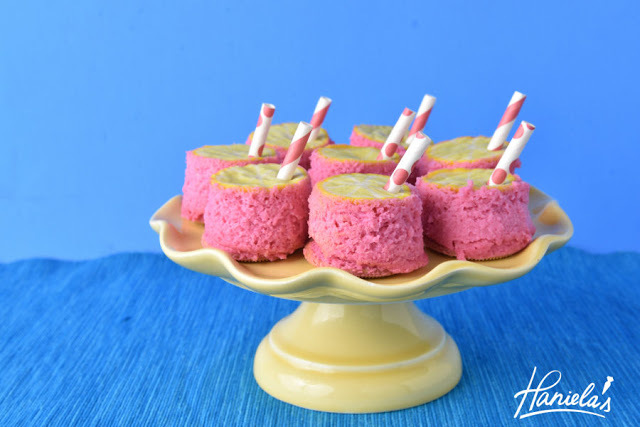 Peel off the parchment paper and eat or you can complete them with a little straw, after all it is a pink lemonade cheesecake. Here is a video how I made these cute little treat, video also includes how to make the lemon curd. Hani, where do you come up with all of these incredible ideas!? You make such pretty jelly roll cakes and now these equally pretty petite cheese cakes. They look mouth watering. So with all of the beautiful cakes and cookies that you create and your delicious savory recipes, how in the world did you find the time to put up 32 quarts of pickles? ? Now that's a Superwoman! What package size did you use for the cream cheese, 8oz or 16oz? My email is [email protected].